How to get static IPv6 addresses from Comcast? I am a Comcast business customers and just had my modem swaped out for one that supports IPv6. I have a block of IPv6 addresses but the tech didn't know how to assign a static IPv6 address. He suggested I contact Comcast customer support. Called Comcast support and was told to assign amy global IPv6 address to the router for IPv6 support. That doesnt' sound right to me, but is that what we are supposed to be doing? Re: How to get static IPv6 addresses from Comcast? Does Comcast support answer question in these forums? Hi Oinda-94563. At this time Comcast does not support Static IPv6 address routing. 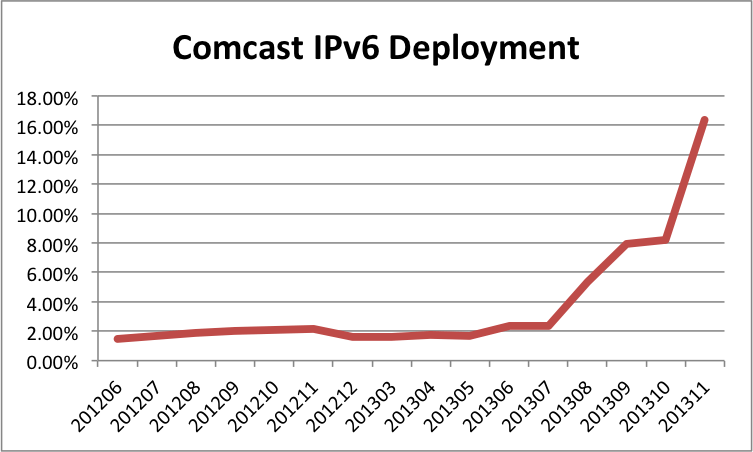 What support does Comcast have for IPv6? When Comcast claims 16+% deployment what do they mean? All areas are IPv6 supported at this time, you can look at http://mydeviceinfo.comcast.net/ for devices that are IPv6 supported... If you look you will see that no CCR is supported at this time.. We are working on these devices at this time. Only Dynamic IPv6 is supported and not static.. So if your a residential sub with a supported cable modem with a supported router IPv6 will be supported. Sweet thanks for confirming.. BCI account's that have a v6 supported device should get Dual-stack..
i would think that v6 should also work with a bridged rental unit. What device type do you have behind the modem? does it support IA_PD? right now i have a custom built Arch Linux router PC. And i think i figured it out; the wide dhcpv6 client needed " prefix ::/60 infinity;" added to its /etc/wide-dhcpv6/dhcp6c.conf file. I made a new topic about this though, if you want to check it out. train_wreck - where is that post you made on the prefix pull (::/60)? Would like to track that once I get my SB6141. It's interesting to note the /64 subnet as well. It's been a few years and there was some news about running out of IPv4 addresses. Any update on this? Is it possible to get a static IPv6 prefix yet? I can get static IPv4 addresses and those are a lot more precious. Also interested to know the current status on the static IPV6 option. I believe I saw in another post that the expected timeframe was sometime in 2015. Will there be additional charges above and beyond the charges for the IPV4 blocks? It has been over a year since this thread had been updated. Does comcast have any plans to ever start providing static IPv6 addresses? As of this time we do not offer static IPv6 address. Please check back for any updates related to this topic. THis is ABSOLUTELY REDICULOUS that we do not have static V6 yet.... I am in a contract with SCAMCAST and was told this was going to be here before the end of 2015. This is static rourting and some BGP on your side. I COULD DO THIS in my SLEEP. WHEN WILL WE HAVE A DATE?